Well over 200 RNs turned out on Thursday, April 11 to vote “YES” to a new 2-year contract that includes NW integration language and Per Diem inclusion. In addition, it includes guaranteed raises for the next two years, a longevity bonus, free UPASS for all Classified RNs starting July 1, 2019, accelerated vacation accrual schedule and more. 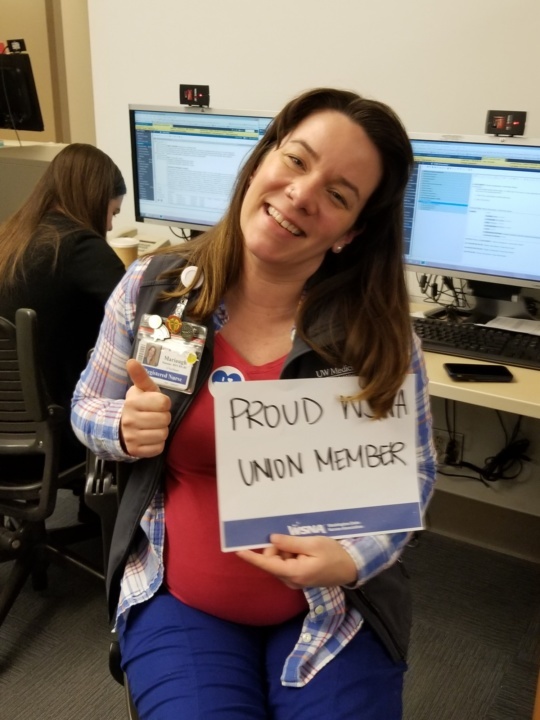 Our negotiations team comprised of UWMC and NW Hospital WSNA RNs worked tirelessly for nearly 25 combined sessions to get to where we are today. A complete summary of the changes can be found at WSNA.org and a final, signed, copy of the entire Collective Bargaining Agreement will be online as well in the next several weeks. NW Hospital will be voting on this same tentative agreement on Tuesday, April 16 to complete this nearly one year bargaining effort. Congrats to all of the registered nurses at UWMC and thank you for all of the hard work you do! Questions? Contact Ed Zercher at ezercher@wsna.org or 206-575-7979, ext. 3022. Convention 2019 is only 4 weeks away! 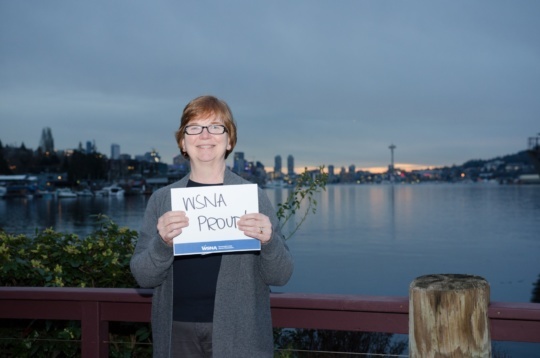 Your UW Medical Center WSNA local unit leaders are sponsoring ten (10) nurses to attend the Washington State Nurses Convention, May 1-3, 2019 at the Tulalip Resort Casino. Don’t miss amazing speakers, great professional development and a full year of CNEs! We’ll cover your registration fee of $450 so you can attend this fun and educational event. If you’re interested in this great opportunity, reach out to us today. The scholarship also includes reimbursement for a 2-night stay, mileage and meals. You can find more information, including the full convention agenda, at rnconvention.org. The Thursday evening banquet is included in the registration fee. The scholarship does not include the $150 optional Suicide Prevention training on Friday. Plan on showing up and casting your vote! We will also be at Roosevelt Clinic North street level lobby from 11 a.m. – 1 p.m.
April 16: 6-9 a.m., 11 a.m.- 1 p.m. and 6-9 p.m. Provides Job Stability: Under the Agreement both the UWMC and NWH nurses will remain under separate collective bargaining agreements and in separate bargaining units for two years. Administration has waived the right to force a combined NWH/UWMC unit in which nurses could be forced to move job locations, float between campuses and face major changes in pay and working conditions. Provides Contract Stability: Both the NWH and UWMC Agreements are due for renegotiation this summer. Because NWH employees will become public employees in just over six months, absent this Transition Agreement your WSNA Teams at NWH will be compelled to negotiate both Agreements this summer and face a second set of negotiations for each agreement or a combined agreement right after integration next January. Multiple negotiations would create enormous uncertainty, and opportunities for the Administration to try to negotiate away your unique benefits. The Transition Agreement TA: The Tentative Agreement will provide for extending the existing NWH and UWMC Agreements with (1) across the board wage increases, (2) contract provisions to integrate NWH nurses into public employee status, (3) provisions to mitigate negative impacts arising from integration, (4) inclusion of most Per Diem nurses at UWMC and all Reserve nurses at NWH and (5) other improvements for both Agreements. Fighting Off Takeaways: Your team fought off big takeaways including a massive loss of vacation value for NW RNs, a raise proposal of just 1% and an extended work day without additional pay for clinic RNs. 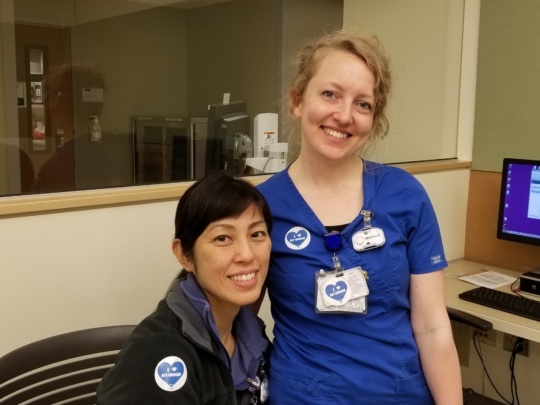 UPASS: Free for all NWH and UWMC nurses July 1, 2019 (ORCA Passes for NWH until January). Guaranteed Wage Increases: Two Percent (2%) Year One, Two Percent (2%) Year Two. NW Hospital RNs will begin receiving these raises on May 15 and UWMC RNs will begin receiving these on July 1, 2019. Longevity Bonus: Longevity bonus of $800 for FTE’d RNs working .7 and above and $400 for FTE’d RNs working a .6 and below in November of 2020. RN must be working at UWMC at time of ratification and still be employed as of date of bonus payout. Job Protection for Reserve & Per Diem Nurses: “Just Cause” for Reserve & Per Diem RNs currently employed at UWMC and NW Hospitals. At the end of this year, Reserve and covered UWMC Per Diem nurses (who work over 350 hours per year) will fall under the protection of “Just Cause,” and may not be fired for performance reasons without a right to correct poor performance and arbitrate unfair terminations. This is a major change! Preservation of UWMC Unique Life Balance Benefits: These include self-scheduling, no-low census and limited call units. All of these benefits have been under attack during the last few rounds of negotiations. Accelerated Annual Leave: Nurses between Steps 4 and 13 will receive increased annual leave days. Per Diem Inclusion: Per Diem nurses (who work 350 hours or more per year) shall now be under the UWMC Agreement and in addition to new just cause protection, shall enjoy other significant contract benefits including guaranteed daily overtime, shift differentials, premiums, participation on key committees and access to the grievance procedure. Per Diem Pay Step Upgrades: Many UWMC Per Diem nurses are not being paid at the highest step they are entitled to. If ratified, UWMC Per Diems will have their hours audited within 90 days of ratification and receive any step increases they are entitled to. Per Diem nurses will continue to receive step increases going forward for every 1872 hours worked. A. Retirement Plan PERS: All nurses shall participate in the State’s pension plan, known as PERS. Nurses will have a choice between PERS II and PERS III plans. Both Plans have vesting periods and different advantages. PERS II includes an increasingly rare defined benefit plan which provides guaranteed income throughout retirement. Full details can be found at www.drs.wa.gov/member/systems/... 60 and over: Your team convinced management to allow nurses age 60 or older (who may not have time to vest before retirement) with 15 years of service who have been contributing to the NWH Plan to receive a lump sum equal to two years contributions under the NWH Plan at the end of this year. B. Medical Plan: All FTE NWH nurses will be enrolled in the State’s PEBB Medical Plan which provides high-quality medical benefits. Premiums are slightly higher for single employees but much lower for families. A premium in lieu of benefits will no longer be available. Reserve nurses will be enrolled if their manager fills out a form attesting to an expectation that the NWH nurse will work 480 hours over the first six months of 2020 and work 8 hours a month thereafter. C. Reserve Nurses: All Reserve nurses working at NWH are being grandfathered into the NWH bargaining unit and may be benefit eligible. However, Reserve Nurses will receive only a six percent (6%) premium due to that eligibility. D. Sick Leave: NWH nurses' sick leave banks will be transferred to UWMC into a carryover bank and preserved for continued use. E. Holidays & Annual Leave: NWH nurses shall be subject to UWMC annual leave and all State Holidays, plus a personal holiday. Total leave is roughly equivalent, but the terms of the UWMC Holiday provision are superior. NWH annual leave banks will be transferred to the UWMC and covered by the UWMC provisions. The UWMC existing annual leave accrual limit is set at 240 hours. NWH with balances higher than 240, shall be given the option to (1) cash out excess vacation at the end of 2019 at 75%, and/or (2) retain and use some or all excess hours before June 1, 2021. Please be on the lookout for a complete summary of changes that will be posted on wsna.org about a week prior to the vote. Not getting your breaks? Working short staffed? Floating to areas without proper orientation? Fill out a Staffing Complaint / Assignment Despite Objection form today. 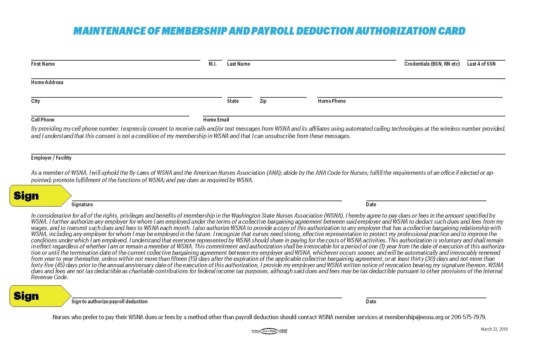 WSNA is excited to announce that online ADO forms are finally here! Nurses are standing together for safe staffing andcompleting a Staffing Complaint/ADO form is the first step. This new online form can be accessed through your phone making it simple and quick. Copies of the submitted online form will automatically be sent to you, your local unit chair, co/vice chair, staffing committee co-chairs, WSNA nurse rep and manager (if you designate). You can find the online form at wsna.org/ADO. For any questions, your nurse representative is here to help. Contact WSNA Nurse Rep Ed Zercher, BSN, RN at ezercher@wsna.org or at 206-575-7979, ext. 3022. Your bargaining team has reached a Tentative Agreement! Early yesterday evening, your team of registered nurses from UWMC and Northwest Hospital Medical Center reached a Tentative Agreement. Having contemplated the alternative of negotiating each contract separately, along with the potential for significant takeaways, your team elected to fight for 2 years of predictability and stability for registered nurses. Under our agreement, your contract will remain largely unchanged at both UWMC and NW Hospital Medical Center, preserving the benefits you are accustomed to. Your team of registered nurses fought off potential takeaways proposed by your employer and made some significant gains along the way! Stay tuned for a detailed update that will be coming your way by the end of the week. Questions? Contact one of us, WSNA Nurse Representative Ed Zercher at ezercher@wsna.org or WSNA Nurse Representative Terri Williams at twilliams@wsna.org. Your elected WSNA local unit officers are sponsoring ten (10) WSNA members to attend the Washington State Nurses Convention, May 1-3, 2019 at the Tulalip Resort Casino. Don't miss amazing speakers, great professional development and a full year of CNEs! The sponsorship covers your registration fee of $450 so that you can attend this fun and educational event. Hotel and mileage may also be eligible for reimbursement. More information, including the full convention agenda, at rnconvention.org. Please contact WSNA Nurse Representative Ed Zercher at ezercher@wsna.org or at 206-575-7979, ext. 3022 to reserve your spot. Scholarships will be given on a first come basis. With the University of Washington School of Nursing, WSNA is offering the opportunity to fulfill your 6-hour mandatory suicide prevention training requirement for licensure as part of your trip to Convention. This training is approved by the Washington Department of health and on their model list. Separate registration required. Lunch provided. 6 CNEs. Your WSNA leadership team recently developed and circulated a staffing survey that went out to all UWMC RNs. We not only had excellent participation, but we also received staggering results. These results were shared with the UWMC Staffing Committee as well as high-level administration in our monthly Conference Committee. UWMC has agreed that staffing has had “issues” and they have committed to working on improving this throughout the hospital. Consistently completing Assignment Despite Objection (ADOs) is more important than ever! UWMC Staffing Committee encourages that ADOs be submitted so they know where the staffing issues exist and where it is vital to make substantial changes. WSNA is committed to representing your concerns and holding the employer to improving staffing starting immediately and throughout 2019. Your working conditions are your patient’s healing conditions. Please keep a look out for a follow-up survey in the next 6 months. Your input and feedback will be the measure of success in holding UWMC accountable to safe and reasonable staffing. 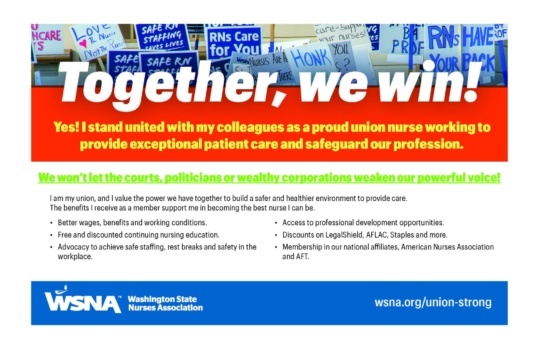 This legislative session, WSNA worked with other union stakeholders and hospitals on this negotiated bill that builds on the 2008 staffing law to strengthen our staffing committees and increase transparency of hospital nurse staffing plans across the state. Require hospitals to accept the staffing committee’s staffing plan or to prepare an alternative annual staffing plan that will be adopted by the hospital. Requires hospitals to submit the adopted staffing plan and subsequent changes to the staffing plan to the Washington State Department of Health beginning January 1, 2019. Requires the hospital to implement the staffing plan and assign nursing personnel to each patient care unit in accordance with the plan beginning January 1, 2019. Allow a nurse to report to, and file a complaint with, the staffing committee any time the nurse personnel assignment is not in accordance with the adopted staffing plan. Allows nurses who may disagree with the shift-to-shift adjustments in staffing levels to submit a complaint to the staffing committee. Require staffing committees to develop a process to examine and respond to submitted complaints, and to determine if a complaint is resolved or dismissed based on unsubstantiated data. Follow the nursing staff personnel assignments as adopted by the hospital based on the complaints compiled by the staffing committee that include aggregate data that show a continuing pattern of unresolved violations for a minimum 60-day continuous period. Exceptions include unforeseeable emergent circumstances and documented reasonable efforts by hospital to obtain staffing to meet required assignments. Require hospitals to submit a corrective action plan within 45 days if the Washington State Department of Health (DOH) finds a violation – and, if the hospital fails to submit a corrective action plan or doesn’t follow its corrective action plan, DOH may impose a civil penalty of $100 per day until the hospital submits a corrective action plan, begins to follow a corrective action plan, or takes other action agreed to by DOH. Require the Washington State Department of Health to maintain public inspection records of any civil penalties, administrative actions, or license suspensions or revocations imposed on hospitals. Requires the Washington State Department of Health to submit a report to the legislature by December 31, 2020, on the number of complaints submitted, investigated, associated costs to DOH, and any recommended changes to statute. Requires a stakeholder group including WSNA to review the report before it is submitted to the legislature. This act expires on June 1, 2023. Into the evening on Monday, March 25, your team of registered nurses from UWMC and Northwest Hospital Medical Center reached a Tentative Agreement. Having contemplated the alternative of negotiating each contract separately, along with the potential for significant takeaways, your team elected to fight for two years of predictability and stability for registered nurses. Your team of registered nurses fought off potential takeaways proposed by your employer and made some significant gains along the way! This agreement solidified the Integration of UWMC and Northwest Hospitals, the inclusion of Per Diem RNs into the WSNA Bargaining Unit and both contracts for the 2019-2021 cycle. Stay tuned for a detailed update that will be coming within a week of the vote. We would like to announce the addition of Chris Jakubowski, RN to our WSNA leadership team at UWMC. Chris has been working days in the Cardiac Cath lab since 2011 and is a tireless advocate for his RN colleagues. Chris was a member of our last contract bargaining team in 2017 and is attending monthly Conference Committee meetings offering solutions to problems. Your team of registered nurses from UWMC and NW Hospital met again with the UWMC administration and management for another session on Friday, March 15. Your WSNA team offered a comprehensive proposal to the UWMC administration. Our offer on behalf of the RNs was intended to prompt the administration to move towards a tentative agreement while keeping in mind the priorities of each bargaining unit. We have agreed to meet again on Monday, March 25 to determine whether or not we are in a place to make a tentative agreement. Please reach out to our team in the event you have questions specific to your concerns. We will keep you informed each step of the way. How will the imminent integration with NW Hospital affect you? Will I get a respectable annual wage increase? How will the contract affect the Per Diems? What will happen to my benefits? Are the self-scheduling, no low census or 28/160 in jeopardy? What happens to my seniority? Will I be required to float between facilities? Meet with your bargaining team, WSNA Reps, WSNA Organizers and Attorney David Campbell. Our team wants to protect your interests and needs your input. Help us determine the best path moving forward in this joint negotiation. Stop by before, during meal or rest break, or after your shift. Bring a colleague. Join us March 11 anytime from 3-7 p.m. in Room BB 1440. Pizza and drinks will be provided. In order to bargain the impact of changes related to the upcoming integration between UWMC and NW hospitals, the UWMC and NWH team of WSNA RNs met with leadership/management yet again on Friday, Feb. 8. WSNA offered UW leadership a comprehensive proposal at our last session with very little agreement from management on those proposals. Management offered a counter but it was not acceptable. We began this session with a counterproposal that showed movement but maintains the priorities identified by the nurses. Due to the threat of inclement weather, the negotiations ended earlier than usual. Management was not prepared to give us a substantive response. We plan to meet again on Friday, Feb. 22. The WSNA team is attempting to mitigate potential concessions for NW Hospital RNs. As a result of NW becoming a state institution, we anticipate RNs may potentially be negatively impacted by mandatory and hospital anticipated changes that are coming. Your UWMC and NW Hospital team of RNs met with UW leadership on Thursday, Jan. 24 in order to bargain the impacts of changes related to the upcoming Integration between UWMC and NW hospitals. 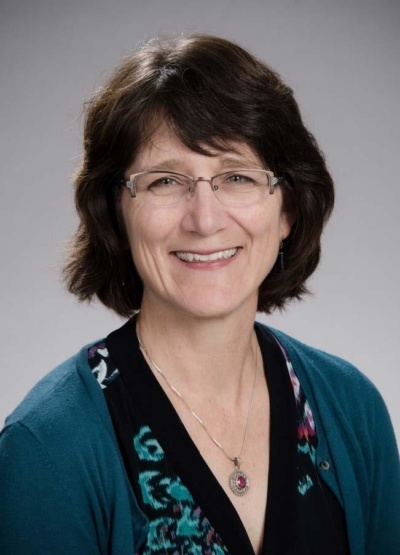 WSNA offered UW administration a comprehensive proposal that included an effort to mitigate potential concessions for NW Hospital RNs as part of the integration. Other content of our proposal included assistance for those negatively impacted by mandatory and hospital desired changes that are coming as a result of becoming a state institution. Protection for Reserve and Per Diem RNs, such as union representation and basic rights. As part of a larger discussion, WSNA also proposed reasonable wage increases for all UWMC and NWH RNs. After waiting for more than five hours, our team received a very disappointing and unacceptable response from the employer. We are contemplating the choice of continuing these “integration” negotiations or pushing ahead with separate contract bargaining for each hospital in the upcoming months. Therefore, WE NEED YOU NOW! Informational meetings and surveys are being planned. Every RN will be needed, as we look forward to your guidance in these negotiations moving forward. If you've moved recently, download and send us a change of information form to make sure we have your most up-to-date information. Anita Stull, RN -UWMC; Tiffany Guyette, RN- NW Hospital; Harry James, RN- UWMC; John Brown, RN- NW Hospital; Teresa Wren, RN- UWMC; Tom Booze, RN- NW Hospital; Ed Zercher, BSN, RN; WSNA Nurse Rep; Terri Williams, MS, RN – WSNA Nurse Rep; and Dave Campbell, WSNA Special Counsel. Questions? Contact a negotiation team member, WSNA Nurse Rep Ed Zercher at ezercher@wsna.org or WSNA Nurse Rep Terri Williams at twilliams@wsna.org. Our team of registered nurses met again with the UWMC and NW Hospital team on Friday, Jan. 18. We’re continuing to collaborate and remain optimistic that we’ll be able to make further strides in this endeavor. The Employer has offered a new proposal and we countered, focusing on preserving benefits and having minimal impact on the NW nurses. We are also having conversations on other topics that include our upcoming contract bargaining and how that might be impacted by these discussions. Both sides are listening and engaging. Experts were available to answer our questions. We will meet again on Thursday, Jan. 24. We’re hoping to receive a counter and make additional inroads. We understand this is and has been a drawn-out process. We appreciate your patience while we endure this arduous process. Stay tuned for further updates. This was the second session that was assisted by a PERC mediator. If you are not, please contact Ed Zercher at ezercher@wsna.org so that we can figure out why that might be. Our next date will continue to include the PERC mediator and will take place on Feb. 22, 2019. Your UWMC and NW Hospital team of WSNA registered nurses last met with UW administration in early November. We have since met as a team to discuss ongoing changes and potential strategies to accomplish this with the least impact on all RNs at UWMC and NW Hospital. Our discussions have been aimed at resolving NW Hospital transition to public employee status. Issues include retirement benefits and Per Diem changes. We are also contemplating how to maintain separate CBAs (contracts) so as to protect each group’s working conditions in light of the possibility of UW seeking to join the units in 2020. Our preliminary challenge is a pre-emptive transition agreement that was proposed by the employer to allow them to get a jump on state-mandated changes. Unfortunately, that proposal included other concessions that your WSNA team is not in favor of. We are working on meeting for three dates in January with UW administration to determine if we can hammer out an agreement prior to opening both contracts but we have agreed as a team, that opening both contracts in the spring may be the best way to maintain current benefits. Stay tuned for updates here, on our local unit webpage. This was the first session that included a PERC mediator in an effort to work through some differences that we have run into along the way. We, your WSNA team, are working on making sure all Per Diems are caught up to the proper wage step. We are also committed to fighting for Just Cause for eligible Per Diem RNs. As “At Will” employees, Per Diem RNs can be let go at any time. We are working to ensure that you can have your side of the story heard and have union representation along the way. Your priorities continue to lead our way in the fight to get Per Diem RNs the benefits they deserve. Questions? Contact WSNA Nurse Representative Ed Zercher at ezercher@wsna.org or at 206-575-7979, ext. 3022. Our UWMC and Northwest Hospital team of WSNA registered nurses met for the third time with UWMC Administration and Labor Relations to bargain over the Integration proposed to take place Jan. 1, 2020. Both sides engaged in discussions around this integration and the potential impacts it may have on registered nurses working at both facilities. Our team is committed to ensuring an open line of communication during this process and will be working closely with the WSNA nurse representatives and attorney to manage the outcomes of this merger. UWMC administration continues to take the position that they do not want any RNs harmed as a result of this integration. Our discussions are preliminary. Additionally, we are still waiting for a large amount of information from the employer regarding proposed changes. Any items that could create changes in wages, hours and working conditions will need to be bargained with WSNA. For any questions, contact a member of the negotiation team or WSNA Nurse Representative Ed Zercher at ezercher@wsna.org or at 206-575-7979, ext. 3022. Has short staffing become the latest trend at UWMC? Short staffing problems should never be left to the RNs at the bedside to figure out. Lately, we have been receiving reports of RNs having to figure out how to work short, how to take more patients then they feel safe caring for and how to divvy up overtime to help fix long known staffing shortages. Short staffing should be remedied weeks in advance of any scheduled shift. That is, unless there is an unanticipated sick call or unanticipated last-minute influx of patients, the unit should be staffed at safe daily core levels for each and every shift. No excuses! Your colleagues are relying on your input to help make positive change. I know it gets old filling out surveys, but this is different. It may use the words “Trigger Staffing,” but it applies to all units whether you use this model or not. Don’t miss a chance to have a voice in how your unit is staffed. Take a few minutes to fill out this survey today. WSNA is using this information to determine compliance by the employer with the laws surrounding staffing in Washington state. WSNA believes that you and your patients deserve better. Take 5 minutes and fill out this survey. WSNA and your local unit team of RNs will be using this data to determine next steps in changing the practice of short staffing. An ADO, or Assignment Despite Objection, is the form that documents a good faith effort on the part of a nurse to call attention to problems that affect patient care, safety or satisfaction. The goal is to fix these problems and ensure they don’t reoccur. Fill them out every time – protect your colleagues, your patients and your license. Your WSNA RN leadership team and nurse representative met with management and administration for our Conference Committee on Oct. 3 – let’s keep this campaign rolling! What is the purpose of filling out an ADO? As a magnet hospital, UWMC requires your input and considers it critical for decision making. The submitted ADO allows local unit officers to present the issues to the Conference Committee with specific details, rather than with anecdotal examples, and request verifiable outcomes. ADOs provide documented evidence that a problem on a unit exists and initiates improvements. Once management has been presented with an issue, it is incumbent upon them to address the situation. Additionally, you are documenting the facts, which may be helpful to you if there is a negative outcome. The ADO is a concerted effort and protects nurses from retaliation. Once the ADO has been submitted management can’t deny knowing your concern. When you find yourself in a situation creates unsafe conditions for patients, or for you, complete the form as soon as possible. More than one nurse may sign the form. Fill out with as much detail as possible, have the immediate supervisor sign it, make two copies, leave a copy with the supervisor, keep the original and fax a copy to 206-575-1908. You can also take a photos/scan and send via email to ado@wsna.org. We need two new WSNA members! Want to be part of creating change at UWMC? Contact WSNA Nurse Representative Ed Zercher at ezercher@wsna.org. Their efforts are to take away your contractual rights! We know that big money and corporate CEOs are attacking workers’ rights given the recent Janus decision by the US Supreme Court. Here in our state, the so-called Freedom Foundation is leading the fight against our interests and our freedom. Many of you may have received a postcard mailing from the Freedom Foundation. Don’t be fooled. The so-called Freedom Foundation does not care about working people, fair wages or safe working conditions. They oppose funding for public employee contracts, and lobbies against paid sick leave. Together we can better advocate for the health of our communities. 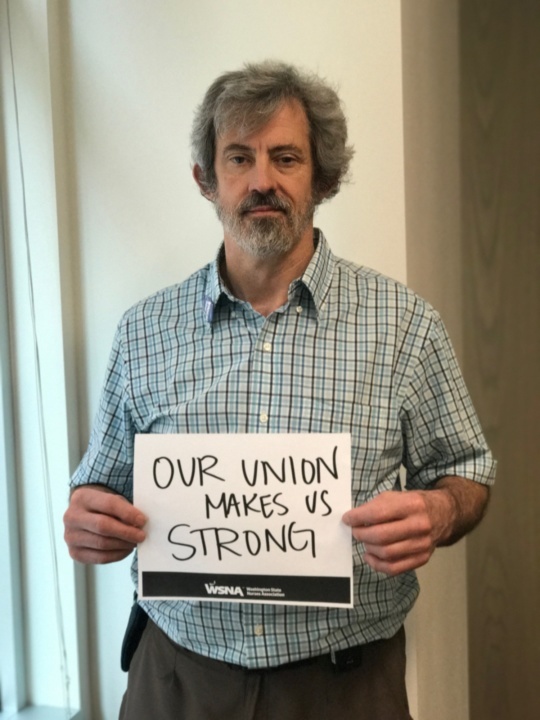 If you have any questions about the impact of the Janus decision or your membership rights, please contact WSNA Nurse Representative Ed Zercher at ezercher@wsna.org / (206) 575-7979, ext. 3022 or WSNA Director of Organizing Tara Goode at tgoode@wsna.org / (206) 575-7979, ext. 3038. Due to a significant stall in the process, WSNA and UWMC have agreed to bring in a PERC mediator to assist with the process. We have narrowed down the mediator selection and are working with PERC to set dates, so stay tuned. In the meantime, remember that your Per Diem colleagues are not covered by Just Cause and could be disciplined or fired for speaking up for patient safety. This poses a significant patient safety risk and WSNA believes that it is the safe and right thing to do in granting the right to Just Cause to the Per Diem RNs. Let’s stand united in this effort to ensure all RNs can speak up with confidence and consistency in the name of patient safety! You recently started receiving a wage increase of 2% as of July 1, 2018. Another raise is coming Jan. 1, 2019. This was not by accident or the generosity of the employer. It is, rather, due to the hard work of your WSNA bargaining team of registered nurses. Check your pay stubs and ensure you are receiving what you deserve! RNs at UWMC have the benefit of a personal day per your contract. This is a day that you can schedule how you wish but unlike vacation, if you don’t use your personal day, you lose it! This is a benefit you deserve – don’t forfeit it. As many of you now know, UWMC has joined with Northwest Hospital Medical Center and it is estimated that as of Jan. 1, 2020, NW Hospital will become UWMC North Campus. This has a lot of considerations for the RNs working at both facilities. Your UWMC and Northwest WSNA local unit leadership teams met with UW administration and labor relations on Friday, Sept. 28 to begin discussions on how this would impact RNs at both facilities. We discussed some mandated changes that will go along with Northwest Hospital becoming part of a state facility as of Jan. 2020. We also discussed some other changes that the employer would like to make – which must be bargained. Your WSNA team of registered nurses has set forth the goal of ensuring that no RN is harmed through the course of this integration. As part of that, we are exploring all options to make sure that you get the best deal possible. We are scheduled to meet again with UW administration and labor relations on Oct. 8. We are committed to keep you informed all along the way. If you are a WSNA member at Northwest Hospital and want to be part of this team moving forward, please contact WSNA Nurse Representative Ed Zercher at ezercher@wsna.org. Your colleagues need you to represent their needs! Please complete this important survey to allow WSNA to have insight into your unit-specific staffing levels and concerns. WSNA is conducting this survey as part of a larger plan, in addition to a current assignment despite objection (ADO) campaign, in order to identify units most critically impacted by short staffing throughout UWMC. Please take 5 minutes to fill out this survey and encourage every one of your RN colleagues to fill it out as well. Your name will be kept anonymous. We value your opinion and do not want anyone to feel as if they are putting themselves in harm’s way by participating. Your identifying information, however, is critical to our data collection. 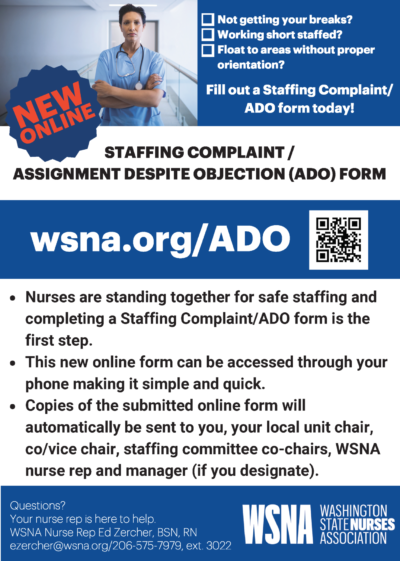 WSNA is starting an ADO campaign and is encouraging all RNs at UWMC to fill out an ADO (found online at wsna.org here) every time that staffing is not what it is supposed to be or presents a safety issue. Submitting an ADO has gotten easier, you can also simply take a photo/scan the form and email it to ado@wsna.org. The data you provide in this survey will be used in the campaign to correct the staffing issues at UWMC. Your name will be held in confidence for WSNA use. Only aggregate or anonymous survey data will be used in discussions with UWMC administration unless otherwise authorized by the individual nurse. If you have any questions, please contact WSNA Nurse Representative Ed Zercher at ezercher@wsna.org. As most of you know, the University of Washington has announced a plan to integrate the UWMC and NWH campuses effective Jan. 1, 2020. The big news is that the University has now told us that its intention is that all NWH nurses will become state employees. WSNA is assembling a team of officers and representatives from both facilities to meet with the UW management as soon as possible. We need to find out details so we can inform all members and prepare to negotiate on the myriad of issues that may be presented. The NWH/UWMC Team will keep you informed, involved and most importantly, hear the voices of WSNA members about this significant transition. For questions or concerns about how you might be impacted, contact your WSNA nurse representative, Ed Zercher, at 206-575-7979, ext. 3022 or ezercher@wsna.org. Stay tuned for updates on this integration! Your team of dedicated WSNA registered nurses met with UWMC management and administration for our 5th and 6th all-day bargaining sessions on May 30 and 31. We were able to reach some tentative agreements, but a number of issues remain unresolved. One of which is equitable hourly wages along with predictable step increases. WSNA bargaining team members will be meeting with the director of payroll in the upcoming days to sort out some ongoing payroll discrepancies for per diem RNs. Your team of WSNA registered nurses is spending countless hours working on behalf of all per diem RNs working at UWMC. WSNA has pressed for quick bargaining dates in order to conclude this process and start having per diem RNs engaged in ongoing issues and discussions. Our next bargaining session is set for June 12 and 14. 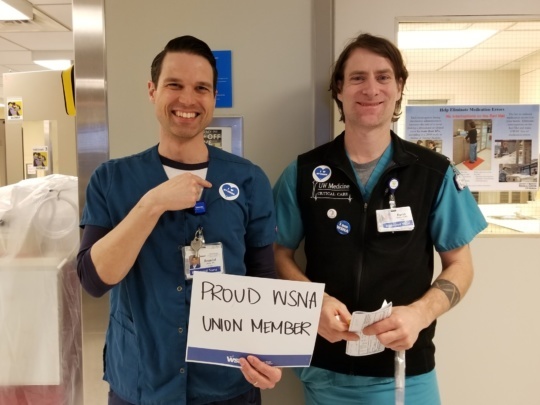 UWMC registered nurses are WSNA strong. United we bargain, divided we beg! For questions, contact your bargaining team members or WSNA Nurse Representative Ed Zercher at ezercher@wsna.org or (206) 575-7979, ext. 3022. On April 19 at 6 p.m., the WSNA officers at UWMC will host a tele-town hall. 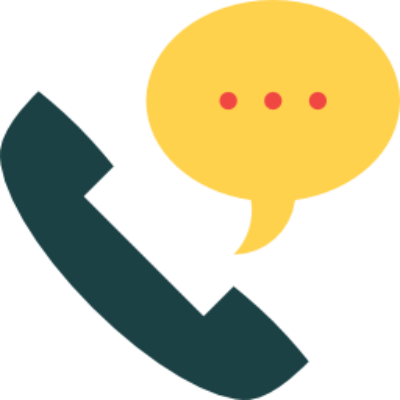 A tele-town hall is a town-hall style meeting over the phone rather than in person. WSNA Chair Harry James wants to update us on what’s happening with our union and at our workplace. There are lots of rumors floating around and the future of certain units is uncertain. Don’t spread rumors – get the facts! It’s also our chance to speak to the officers about issues that we care about and to ask questions. It’s easy to participate, but you must register ahead of time to get a PIN. Questions? Contact WSNA Nurse Organizer Sydne James at 206-575-7979 x3004. Register online now to get your PIN at bit.ly/2H1fEss. Have you seen this? This is our WSNA recommitment card. Within a few months, the U.S. Supreme Court will decide on a case called Janus v. ASFCME. It could have a devastating effect on our union power as public-sector nurses. All public-sector union employees will be impacted nationwide. The case is designed to do one thing: silence our voice. 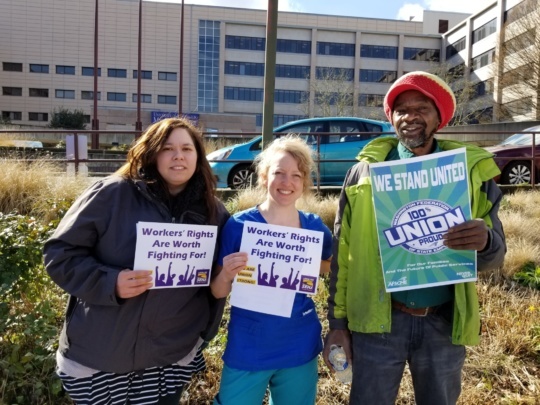 At UWMC, union nurses are fighting back. We have an all-time high membership here and we mean to use the power that comes with it to shut down those who mean to harm us. Our membership is our power. Anyone who tells you otherwise has an ulterior motive and should be ignored. We, the officers at UWMC, along with our elected leaders and staff at the local, state and national level, believe that by signing a recommitment card today you will be taking the first step to ensuring we maintain and even increase the power we have to continue advocating for our patients and our profession. If you are not yet a member of WSNA, we urge you to join today. There is no time to waste. Join nurses from around UWMC to stand up for the issues that matter to us all, like staffing, rest breaks and safe patient care. The recommitment card is equivalent to a membership application. Give to Harry, Charles or Teresa. (Our contact info is found on your unit WSNA bulletin board or at wsna.org/union, under UWMC). 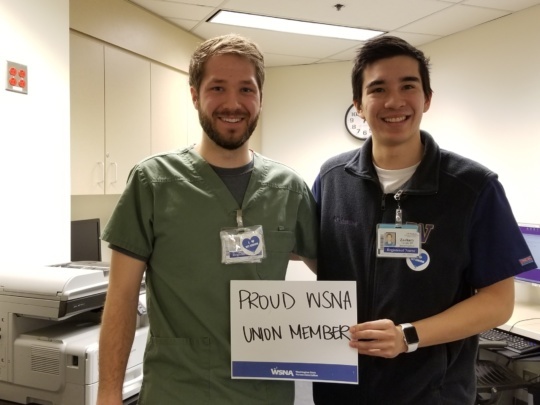 As your WSNA elected officers, we again want say how proud we are to celebrate and support the WSNA members at UWMC. As such we have a gift for all members and we plan to distribute these during Nurses Week. Look in your mail box on your unit for yours. Passing these gifts out is a tall order as there are hundreds of members. We are looking for a volunteer from every unit or work area to help pass out these gifts to the WSNA members. Will you help us? Contact Harry, Charles or Teresa to volunteer. (Our contact info is found on your unit WSNA bulletin board or at wsna.org/union, under UWMC). In addition to this gift, stay tuned for something special happening for RNs at the various UWMC locations during Nurses Week. These events will be announced ahead of time via email and on the Facebook page:www.facebook.com/UWMCnurses. I have worked at UWMC for 30 years and have been a per diem since 2001, primarily for Maternity Infant Center. It is hard to believe we per diems have never had the benefit of WSNA representation or a contract and I am pleased to be part of this historic event. I have seen some concerning and confusing practices be mandated as a per diem in recent history and it has not felt secure to be a per diem now, as it once was. This makes the need for contract protection ever more urgent. The negotiations team is very skilled in advocating for professional nursing rights. Ironically, I was a staff RN rep to this same team as a nearly-new grad back in the 1980’s and I also have experience on the administrative side in my other role as a manager on Whidbey, so I think I bring some good skills to the table on your behalf. As many of you know, we have our third negotiations team meeting with UWMC administration on April 18. Our goals include protecting our valuable per diems from unfair scheduling, wages and work practices, especially in comparison to other hospitals whose per diems are represented by a good contract. It is also important that we work for consistency among the UWMC per diems, so that unit-based practices don’t put some per diems at a disadvantage and there is a feeling of cohesiveness and unity between the per diems and the staff RNs who are all represented now by WSNA. Please feel free to reach out to me if I can answer any questions you have about this monumental undertaking. Please sign up to join WSNA so your voice is heard loud and clear in support of our efforts! Membership applications are online at: https://www.wsna.org/membership/introduction. 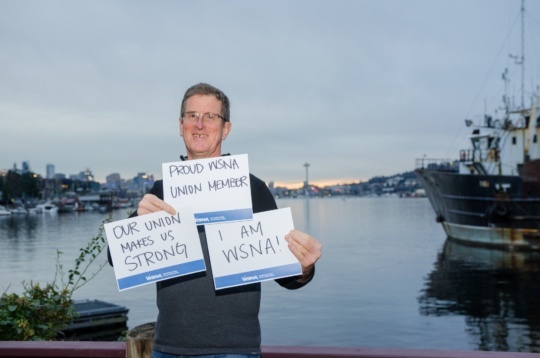 You're invited to our first WSNA union Tele-Town Hall! Thursday, April 19, 2018 at 6 p.m. Please join us via telephone for a town hall meeting with our WSNA elected nurses to hear important updates on critical issues in our workplace. We also want to hear your ideas, issues and concerns. Questions? Contact WSNA Nurse Organizer Sydne James at 206-575-7979 ext 3004 or SJames@wsna.org. Workers' rights are worth fighting for! 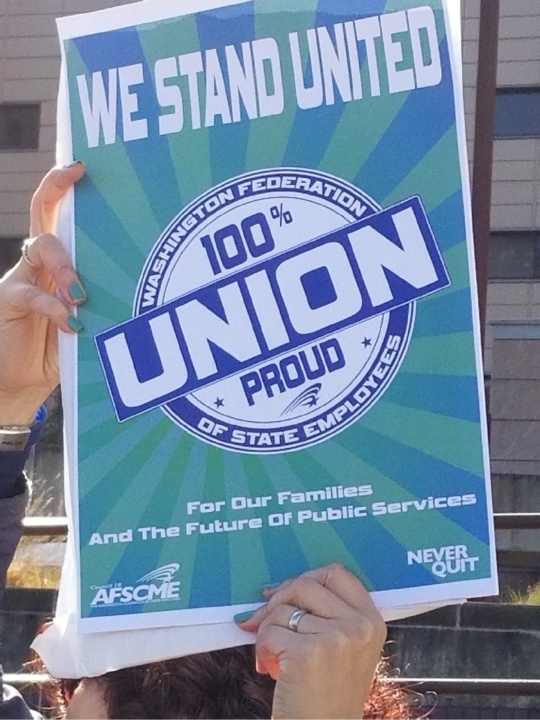 Workers from across UW took a stand against the powerful corporations who are trying to use the Supreme Court and Janus v AFSCME case to divide us from our co-workers and limit the power in numbers we have together in our union this past Monday, Feb. 26.